Xenobiotics originating from reclaimed wastewater: Uptake by crops and exposure assessment. In this project we aim to elucidate the mechanisms controlling the uptake and translocation of organic pollutants by crops and to evaluate the exposure of the Israeli population to these chemicals via food consumption. To accomplish these goals, we have started plant uptake experiments on different plants having edible roots, leaves or fruits using different soils and wastewater qualities. 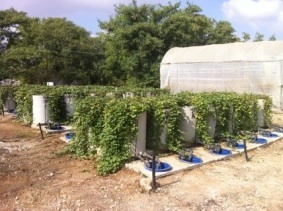 Experiments are being conducted in a controlled greenhouse and in a lysimeter station. Tomer Malchi, a M.Sc. student and Myah Goldstein, a PhD student have joined CEAEH and are working in this project as part of their theses. Abstract: Pesticides are bioactive compounds, intended to disrupt a primary target in the pest. The use of pesticides is essential for intensive agriculture, particularly in warm climate, which is characterized by rapid reproduction of pests. However, pesticides can have deleterious effect on ecosystems, as well as on the quality of air, water, land, and public health. The overall goal of this project is to elucidate the mechanism of transformation of selected organophosphate pesticides on crop surfaces in the time frame prior to their consumption. The main objective is to quantify organophosphate pesticides and their metabolites on edible crops. Study team: Prof. Benny Chefetz – Principal investigator for the study. Noam Kirshenbaum a second year PhD student. Abstract: Psychoactive drugs are a class of chemical substances that act on the central nervous system altering behavior and cognition. Psychoactive drugs most often cross the blood to the brain based on passive diffusion of the blood-brain barrier, which consists primarily of a lipid bilayer. The environmental fate of psychoactive and other central nervous system drugs, which can cross the blood brain barrier are therefore of special interests since they are more likely to be taken up, translocated and to accumulate in plants irrigated with treated wastewater. Furthermore, the interdisciplinary perspective may enable to cross reference between pharmacology in the mammals with xenobiotic interactions in plants and provide insight in both fields of study. This project aims is to evaluate uptake, translocation and metabolism of psychoactive drugs (pharmacokinetics) by agricultural crops, as well as the potential physiological effects of psychoactive drugs on plants (pharmacodynamics). Prof. Benny Chefetz – Principal investigator for the study. Tomer Malchi a third-year PhD student. Sivan Shiponi a BSc student, Assaf Rosenberg a BSc student.